Santa Cruz Barillas dam and Hidralia bringing violence, repression and impunity into local communities; the case was brought to the Permanent Peoples Tribunal hearing in Geneva. Communities finally won: in Dec 2016 Hidralia cancelled the project! (Español, abajo) Summary of the conflict. The conflict is related to the project of a small hydroelectric plant in Santa Cruz Barrillas, Guatemala, part of the bigger project Cambalam 1. The transnational corporation (TNC) at the center of the conflict is the Spanish Hidralia S.A., a TNC specialized in water-cycle management processes which include hydroelectric energy, dams, infrastructure, civil engineering, water supply and sanitation. The conflict relates to the activities of Hidro Santa Cruz, which is owned by Hidralia's subsidiary Ecoener-Hidralia Energía, which itself is dedicated to project development, engineering and consulting. 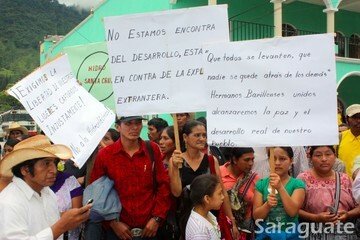 The contentious activities were carried out between June 2007 and January 2013, in Santa Cruz Barrillas, Huehuetenango, Guatemala. They include in particular the complicity with the Spanish and Guatemalan governments for their role in the invisibilization, criminalization and persecution of the Q'anjob'al people who were legitimately resisting the hydroelectric project. All parties are also complicit in the violent response to this resistance which took the form of, inter alia, intimidation, murder, illegal and arbitrary detentions, land spoiling and dispossession, all in violation of applicable human and peoples' rights established in international and national law, and in particular in the UN Universal Declaration of Human Rights, the International Covenant of Civil and Political Rights, the International Labour Standards of the International Labour Organisation (ILO), the ILO Convention 169 on Indigenous Peoples, the American Convention on Human Rights, and in the Constitution of the Republic of Guatemala. History of the conflict In June 2007, the community of Santa Cruz Barrillas (composed of 86,1% Q’anjobal indigenous population and 13,9% mestizos), knowing about the recent granting of licenses for the exploitation of the local natural resources, organized a popular consultation, in which 46,481 people participated, 46,472 of which rejected industrial activities in the area. Nevertheless, Hidralia Energia was installed in Guatemala and started the planning of a series of projects, among which was the small hydroelectric plant in Santa Cruz Barrillas, managed by Hidro Santa Cruz and included within the bigger project Cambalam 1. As people associated with the TNC started frequenting the area, pressuring the locals into selling their land for the project, resistances were organized in the community, but both the company and the government began a media campaign to delegitimize and weaken it. The clash between both parties intensified during the following years, as Hidro Santa Cruz continued preparing the construction of the site, which at this point did not have the consent of the local authorities, but with the support of the national government. The peak of the conflict was reached in 2012, when after months of coercion, intimidation and repression, one of the security guards shot and killed Mr. Andrés Francisco Miguel, a local member of the resistance. This was used by the Guatemalan government as the pretext to declare a ‘state of siege’, which resulted in the illegal detention of 11 activists and most of the human rights violations that this case has caused (intimidation, harassment, restriction to the rights to education and food, violence against women, etc.). The Q'anjob'al people have ever since tried to establish accountability for the violations, but they have encountered endless obstacles to it. Nevertheless, as of 2014, the resistance has managed to stop the project temporarily. The role of the Architecture of Impunity Both the entry of Hidralia to Guatemala and the lack of corporate accountability respond to a systematic pattern of conduct by TNC’s protected by an “Architecture of Impunity”, enshrined in FTAs, BITs and other trade and investment policies demanded by international financial institutions such as CIFI, IMF and World Bank. Despite the disapproval of the local population, the entry of the TNC in the country was facilitated by several actors. A third of the project was financed by the Inter-American Investment Corporation (CIFI), which has, among others, the World Bank and the BID as shareholders, and since its beginning there has been a stress by the proponents of the project to frame it as a benefit to the country despite the rejection of the affected population. The Spanish government has avoided taking a position regarding the human rights violations and only transfers the responsibility to the Guatemalan government, although always showing support for the construction of the plant. The Guatemalan government has in fact collaborated in the repression of the Q'anjob'al people and has facilitated the construction of the site by passing laws that benefit the corporation, many of which are claimed to be unconstitutional. Furthermore, these kind of investments by European TNCs are able due to the EU-Central America association agreement, which did not initially discuss the protection of human rights. Attempts of access to justice The community of Santa Cruz Barrillas, who already expressed its discontent with possible industrial activities in the public consultation in 2007, has struggled to access to justice in the local, national, regional and international levels. Many of their efforts, for instance, their complaint to the Procuraduría de Derechos Humanos de Guatemala, have gone unnoticed or received no response. Likewise, many members of the resistance have had difficulties in defending themselves against the accusations and illegal detentions from the company, proving the partiality of the judicial system. The same pattern of criminalization is repeated with different members of the resistance over the years, the most recent case being the imprisonment of Francisco Juan Pedro, Adalberto Villatoro “Don Tello” and Arturo Pablo. Maybe the clearest case of state compliance is the fact that the two people accused of being responsible for the assassination of Mr. Andrés Francisco Miguel have been released. The discourse of the government of Guatemala, always favorable to the corporation’s interests, has tried to delegitimize the opposition to the project from the first moment, making the effective access to justice impossible. There have also been attempts to access justice through the legal system in Spain, country of origin of the TNC, but with no success so far. The Spanish Minister of Foreign Affairs and the Spanish Embassy in Guatemala were both contacted regarding the human rights violations, but they delegate any responsibility to the Guatemalan government, which makes this route to justice impossible. In July 2014, an official complaint was presented to the Spanish Ombudsman by several of the organizations implicated in the conflict. The several petitions presented to the Inter-American Commission on Human Rights (CIDH) in 2013, which include the preparation of a report regarding the abuses perpetrated during the state of siege or the end of the state repression and criminalization, are still being processed and have not proved sufficient to guarantee the respect of the human rights of the population, nor of the result of the public consultation. 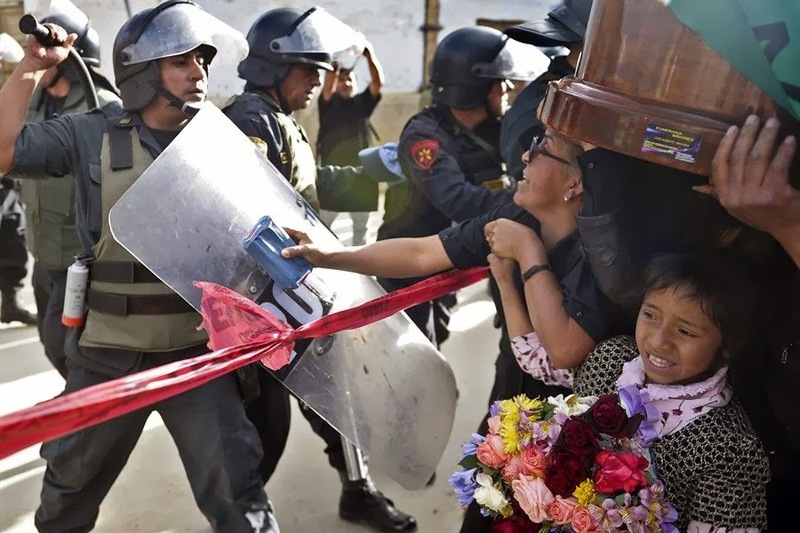 What Justice could do: a say from the PPT In a hearing that was held in Geneva in June 2014, the Permanent People’s Tribunal (PPT) listened to the testimony of Micaela Antonio Gonzalez and Alfredo Baltazar, from CEIBA Friends of the Earth Guatemala. In line with the evidence brought before the judges by these witnesses, the Tribunal recognized the actions of the transnational corporation as another example of violations of human and people rights. In line with its full judgement of Madrid, in May 2010, and just a few months before the session that was held in Mexico in December 2014, the PPT underlined once again how transnational corporations, including Hidralia, systematically violate human and peoples’ rights to their own profit. In the same line, the PPT recognized in this widespread practice the current shortcoming of international law, namely the impossibility of accessing justice and obtaining a remedy that is increasingly becoming an unbearable burden for affected communities, as well as for the laws that are supposed to give them shelter. In the same spirit, the PPT acknowledged the necessity to improve international legislation, including through a binding treaty on transnational corporations, and a Peoples’ treaty, in order to hold transnational corporations accountable for their actions. Español Resumen del conflicto El conflicto en cuestión está relacionado con el proyecto de una represa hidroeléctrica en Santa Cruz Barrillas, Guatemala, parte del mayor proyecto Cambalam 1. La empresa transnacional (ETN) en el centro del conflicto es la española Hidralia S.A., una transnacional especializada en procesos de gestión del ciclo integral del agua, que incluyen energía hidroeléctrica, represas, infraestructura, ingeniería civil, abastecimiento y saneamiento. La empresa es acusada por las actuaciones de la empresa Hidro Santa Cruz, una sociedad filial de Ecoener-Hidralia Energía, empresa subsidiaria de Hidralia dedicada al desarrollo de proyectos, obras de ingeniería y consultoría. Las actividades cuestionadas fueron llevadas a cabo en Santa Cruz Barrillas, Huehuetenango, Guatemala, entre junio del 2007 y enero del 2013, e incluyen en particular la complicidad con los gobiernos Español y Guatemalteco por la invisibilización, criminalización y persecución del pueblo Q’anjob’al y de la resistencia legítima al proyecto hidroeléctrico. Asimismo, las acusaciones también incluyen las reacciones violentas frente a la oposición al proyecto mediante intimidaciones, asesinatos, detenciones arbitrarias e ilegales, y despojo de tierras, en violación de los derechos humanos y de los pueblos establecidos en el derecho nacional e internacional aplicable, en especial en la Declaración Universal de Derechos Humanos de Naciones Unidas, en la Carta de Naciones Unidas Pacto Internacional de Derechos Civiles y Políticos, en las Normas Internacionales del Trabajo de la Organización Internacional del Trabajo (OIT), en el Convenio 169 sobre Pueblos Indígenas de la OIT, en la Declaración sobre los Derechos de los Pueblos Indígenas de la ONU, en la Convención Americana sobre Derechos Humanos, y en la misma Constitución de la República de Guatemala. Historia del conflicto En junio de 2007, la comunidad de Santa Cruz Barrillas (compuesta por un 86,1% de población Q’anjob’al y un 13,9% mestiza), a raíz de la reciente concesión de licencias para la explotación de los recursos natural locales, organizó una Consulta de Buena Fe, un mecanismo indígena tradicional de toma de decisión, en la que participaron 46,481 habitantes, de las cuales 46, 472 rechazaron las actividades industriales en la zona. No obstante, Hidralia Energía se instaló en Guatemala y comenzó la planificación de una serie de proyectos, entre los cuales se encontraba la pequeña central hidroeléctrica en Santa Cruz Barrillas, gestionada por Hidro Santa Cruz, filial de Hidralia Energía, e incluida en el mayor proyecto Cambalam 1. Mientras personas asociadas a la ETN comenzaron a frecuentar la zona, presionando e intimidando a los locales para la compra de tierras, una resistencia al proyecto se organizó en la comunidad, a pesar de los esfuerzos de la compañía y el gobierno para deslegitimar y debilitarla. Los enfrentamientos entre ambas partes se intensificaron durante los años siguientes a medida que Hidro Santa Cruz continuaba preparando la construcción de la represa, que en este momento ya no contaba con el consentimiento de las autoridades locales pero sí con el apoyo del gobierno guatemalteco. El momento más crítico del conflicto se dio en 2012, cuando, tras meses de acoso, intimidación y represión, uno de los guardas de seguridad de la planta disparó contra el Sr. Andrés Francisco Miguel, campesino y líder de la resistencia, quien falleció en el acto. Este hecho fue usado por el gobierno de Guatemala para decretar un estado de sitio, durante el cual se produjeron la mayoría de violaciones de derechos humanos sobre la población (intimidación, acoso, restricción al derecho a la educación y alimentación, prácticas de abuso contra las mujeres, etc. ), incluyendo la detención ilegal de 11 activistas. El pueblo Q’anjob’al ha tratado desde entonces llevar ante la justicia a los responsables de dichas violaciones, pero se han encontrado con numerosos obstáculos para ello. No obstante, la resistencia ha conseguido detener el proyecto temporalmente. El papel de la Arquitectura de la Impunidad Tanto como la entrada de Hidralia a Guatemala como la falta de responsabilidad corporativa responden al patrón de conducta de las ETN favorecido por la “Arquitectura de la Impunidad”, consagrada en los distintos tratados de libre comercio e inversión demandas por instituciones financieras internacionales como el CIFI, el FMI y el Banco Mundial. A pesar del rechazo de la población local, debidamente expresado en la Consulta de Buena Fe, la entrada de la ETN al país fue facilitada por varios actores. Por ejemplo, un tercio del proyecto fue financiado por la Corporación Interamericana para el Financiamiento (CIFI), entre cuyos accionistas se encuentran el Banco Mundial y el Banco Interamericano de Desarrollo, y desde el comienzo ha habido un esfuerzo por parte de sus promotores de calificar el proyecto como beneficioso para el desarrollo del país sin importar la opinión contraria de la población afectada. El gobierno español ha evitado tomar una posición acerca de las violaciones de derechos humanos y transfiere la responsabilidad al gobierno guatemalteco, siempre bajo la perspectiva de dar continuidad a la construcción de la represa. El gobierno de Guatemala, por su parte, ha colaborado en la represión ejercida sobre el pueblo Q’anjob’al y ha facilitado la construcción de la planta al modificar y aprobar leyes que benefician a la ETS, muchas de las cuales sostienen recursos de inconstitucionalidad. En última instancia, este tipo de inversiones en las áreas de energía y aguas de transnacionales europeas en la región son facilitadas por el Acuerdo de Asociación entre Unión Europea y Centroamérica, que inicialmente no discutió el tema de derechos humanos. Intentos de acceso a la justicia La comunidad de Santa Cruz Barrillas, que ya había expresado su rechazo a actividades industriales en la Consulta de Buena Fe en 2007, se ha encontrado con numerosos obstáculos para el acceso a la justicia local, nacional, regional e internacional. Muchos de sus esfuerzos, como la queja ante la Procuraduría de Derechos Humanos de Guatemala, han sido ignorados. De igual manera, muchos miembros de la resistencia han tenido dificultades al tratar de defenderse antes las acusaciones y detenciones ilegales por parte de la empresa, demostrando la parcialidad del sistema judicial. El mismo patrón de criminalización se ha repetido con varios miembros de la resistencia, siendo el más reciente la encarcelación de Francisco Juan Pedro, Adalberto Villatoro “Don Tello” y Arturo Pablo. Quizás el caso más claro de la complicidad del estado sea el hecho de que las dos personas acusadas por el asesinato del Sr. Andrés Francisco Miguel estén ahora en libertad. El discurso del gobierno de Guatemala, siempre favorable a los intereses de la transnacional, ha tratado de deslegitimar a la oposición al proyecto desde el primer momento, haciendo imposible el acceso efectivo a la justicia. También han existido intentos de involucrar a la justicia Española, país de procedencia de la ETN, pero sin éxito por ahora. Tanto el Ministro de Asuntos Exteriores español como la Embajada española en Guatemala fueron contactadas acerca de las violaciones de derechos humanos, pero tan solo delegan la responsabilidad en el gobierno local, lo que también hace inviable este ruta legal. En julio del 2014, algunas de las organizaciones implicadas presentaron una queja ante la Defensora del Pueblo de España. Las numerosas peticiones presentadas ante la Corte Interamericana de Derechos Humanos (CIDH) en 2013, que incluyeron la preparación de un informe sobre los abusos perpetrados durante el estado de sitio y exigencia del cese de la represión y criminalización estatal de la protesta social, aún siguen en trámite y no garantizan el respeto de los derechos humanos de la población ni del resultado de la Consulta de Buena Fe. Lo que la justicia podría hacer: una opinión del TPP En la sesión en Ginebra de junio, 2014, el Tribunal Permanente de los Pueblos (TPP) escuchó el testimonio de Micaela Antonio Gonzalez y Alfredo Baltazar, de CEIBA Friends of the Earth Guatemala. De acuerdo a lo expuesto ante los jueces del tribunal, éste reconoció las acciones de la corporación transnacional como otro ejemplo de violaciones de derechos humanos y de los pueblos. De acuerdo a la sentencia de Madrid, en mayo de 2010, y unos meses antes de la sesión que tuvo lugar en México en Diciembre 2014, el TPP resaltó de nuevo cómo las corporaciones transnacionales, incluida la implicada en este conflicto, violan sistemáticamente estos derechos para su propio beneficio. El tribunal reconoció en esta extendida práctica la evidente limitación del derecho internacional. La imposibilidad del acceso a la justicia y a obtener remediación está convirtiéndose en una carga cada vez mayor para las comunidades afectadas, así como las leyes que deberían protegerlas. Así mismo, el TPP reconoció la necesidad de mejorar la legislación internacional, incluyendo un tratado vinculante para las corporaciones transnacionales y un Tratado de los Pueblos, para que así estas empresas sean consecuentes con sus acciones. UPDATES: Currently, four activists are being under detention, Francisco Juan Pedro ("Chico Palaz”), Adalberto Villatoro (“Don Tello”), Arturo Pablo of q’anjob’al origins. 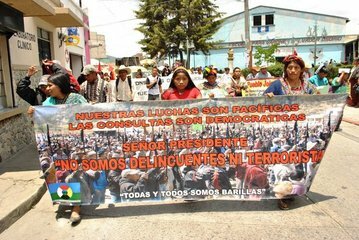 Update Jun 2016 from Global Witness 2015 report: "In Barillas, northern Huehuetenango, indigenous Mayan leaders have been killed, threatened and criminalized because of their opposition to numerous dams planned in the region. On 24 March 2015, community leader Pascual Pablo Francisco, disappeared from his home in Barillas. Three days later, his body was found in a ditch with signs of torture.120 The same day as Pascual’s disappearance two other leaders, who actively opposed the dams, were detained in Guatemala City." UPDATE: From Telesur tv - Published 27 December 2016: "Spanish mining giant Hidralia has abandoned its hydroelectric project Cambalam in Santa Cruz Barillas, in the department of Huehuetenango, under pressure of local social movements, it announced via a communique issued Monday." The proposed hydroelectric plant would be able to produce 4.9 MWs in each of its two phases. It would be installed in an area traditionally used as a recreational and ceremonial center and limit the domestic and agricultural use of water in an already fragile environment, home to several amphibian and insect species found nowhere else. The affected communities were never consulted about the project, despite over 45,000 inhabitants (one third of the total population) expressing their rejection to industrial activities in the area on a popular consultation. The initial investment for the project is estimated in 30 million dollars, a third of which is proportioned by CIFI, a corporation in which the World Bank and the BID, among others, are shareholders. El proyecto hidroeléctrico propuesto llegaría a producir 4.9 MWs en cada una de sus dos fases. Se instalaría en un área tradicionalmente utilizado como centro de recreación y ceremonias y limitaría el uso doméstico y agrario del agua en un entorno ya de por sí frágil, hogar de varias especies endémicas de anfibios e insectos. Las comunidades afectadas nunca fueron consultadas acerca del proyecto, a pesar del resultado de una consulta popular en la que 45,000 habitantes (un tercio de toda la población) se opusieron a actividades industriales en la zona. La inversión inicial para el proyecto se estima en 30 millones de dólares, un tercio de la cual fue proporcionada por CIFI, una corporación de la cual el Banco Mundial y el BID son accionistas. Why? Explain briefly. The construction of the plant has not yet started and is paralyzed due to the actions of local organizations. There is an office of the company installed in the area. La construcción de la planta no ha comenzado aún y se encuentra paralizada debido a las acciones de organizaciones locales. Existe una oficina de la compañía en el área del proyecto. UPDATE Dec 2016: La compañía hidroeléctrica Hidro Santa Cruz ha anunciado que no continuará en Guatemala, después de ocho años de resistencia indígena. En El Diario, la ONG Amigos de la Tierra y Mujeres de Guatemala explica que "aún queda mucho por hacer. El conflicto que ha supuesto la presencia de Ecoener-Hidralia en la zona trajo, según la ONG, "altas cotas de vulneración de derechos humanos" entre los que denuncian "asesinatos, secuestros, amenazas, agresiones a mujeres, encarcelamiento de líderes comunitarios y un grave deterioro del tejido social".